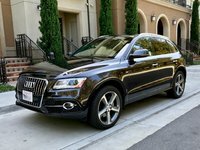 CarGurus has 1,476 nationwide Touareg listings starting at $2,488. There are a few tweaks to Volkswagen’s high-end Touareg midsize 5-door 5-passenger crossover for 2017. Don’t worry, though--the most expensive and luxuriously appointed offering in the German automaker’s stable remains a handsome and well-appointed family mini-ute, admirably suited to the daily commute and those trips to the mall or home improvement store. Perhaps the most noteworthy change for the upcoming year’s Touareg is the replacement of the midlevel Lux trim with what VW labels the “value-oriented” V6 Wolfsburg Edition. The new trim will be slotted between the entry-level V6 Sport and the flagship V6 Executive trims, both of which return from 2016. The V6 Sport with Technology sub-trim, including features like an 8-inch infotainment touchscreen for the standard navigation system, also returns. All trims are slated to feature standard 4Motion all-wheel drive (AWD) and 64 cubic feet of cargo space with the rear seatbacks folded. The 2017 Touareg will also remain perched atop the same chassis as the Audi Q7 and Porsche Cayenne for a comfortable, well-balanced ride and strong handling. Returning in the 2017 Touareg is the standard 3.6-liter V6 powerplant that puts out 280 hp and 266 lb-ft of torque under the management of an 8-speed shiftable automatic transmission. This midsize crossover is capable of towing up to 7,716 pounds, but it has clocked a comparatively sluggish 0-60 mph time of 7.7 seconds in at least one track test. Mileage isn’t exactly a highlight either, with the current 17 mpg city/23 highway/19 combined not anticipated to improve for the coming year. The standard 4Motion permanent AWD system features a locking center differential and is suitable for wintry weather but not for journeying off-road. Inside the 2017 Touareg, look for some serious plush, with high-end materials and workmanship bolstered by such classy touches as wood and chrome accents. A squared-off cargo bay sets itself apart from the sloping rooflines of most rivals to make the most of the available space. Standard LED cabin lighting is also a nice touch, as are the reclining and sliding rear seats, while a further upgrade for 2017 adds VW’s Driver Assist package and Park Distance Control (Park Pilot) as standard equipment on all trims. All 2017 Touareg trims will boast such upper-level features as dual-zone automatic climate control, a cooled storage compartment, a remote garage door opener, satellite radio, and a memory-card slot. The Executive adds new-for-2017 21-inch alloy wheels and rear parking sensors, keyless entry and ignition, heated rear seats, and a 10-speaker 620-watt Dynaudio premium stereo with a video monitor. The new Wolfsburg Edition is slated to improve on the deleted Lux with upgraded 18-inch wheels, enhanced cabin accents, heated front seats, and contrast stitching for the floormats, steering wheel, and shift knob. The Sport with Technology sub-trim is also upgraded for 2017 with a standard heated steering wheel and a number of improved safety features. Options of note for Volkswagen’s luxury crossover include a set of blacked-out 20-inch Mallory wheels and an all-black interior color scheme, each of which is available to the midlevel Wolfsburg Edition. A trailer hitch and wiring remains optional for the entire lineup, as do various cargo management tools, a roof rack, aluminum door sills, and a rear spoiler. In addition to standard government-mandated safety equipment aboard the 2017 Touareg, look for all trims to sport standard turn-signal-integrated mirrors, high-intensity-discharge (HID) headlights, and the standard Driver Assist package, with auto-hold braking, adaptive cruise control, forward-collision warnings, and lane-change assistance. Additional standard safety features will now include VW’s unique Park Pilot, along with such current offerings as LED daytime running lights, front fog/driving lights, and a post-collision safety system. Curiously, the Touareg does not offer VW’s Car-Net emergency telematics, which is either standard or optional on just about all the automaker's other models. 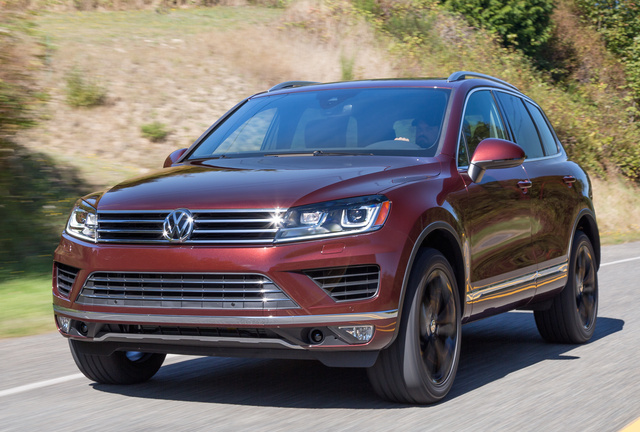 The Insurance Institute for Highway Safety (IIHS) awards the current Touareg its highest score of Good for overall crashworthiness, but this score does not include the recently added testing for small-overlap frontal-offset protection. Look for the 2017 Touareg to again challenge the likes of Lexus’ RX and Acura’s MDX in the luxury crossover market, with the latter offering 3 rows of seating for those with carpooling obligations. And should off-road adventures be in your future, you may want to take a look at Jeep’s rugged Grand Cherokee. What's your take on the 2017 Volkswagen Touareg? Have you driven a 2017 Volkswagen Touareg? Is there a way to track it somehow? I don't have any special features activated on it. Can I Disable Power Sunroof On 2017 Touareg By Removing Fuse? Which Fuse? I want to use my older kayak rack on new vehicle but it doesn't fit without rubbing power sunroof so wondered if I just disable sunroof when needing to carry my kayaks?